Whether you need to thank a referral source, are trying to close a sales call, wishing to get a "foot in the door" or make inroads into new markets, we'll provide gift options that can make a difference. Marketing Departments send our "Thank You" gifts for referrals, for customers selecting their company and even "Thank You" for your patience or understanding–– for smoothing over unintended slip-ups. Our "Congratulations" gifts are sent for client promotions or office relocations, personal awards and recognition. Market Positioning campaigns can involve giftware and/or gift baskets oriented to specific demographic groups. Event & Meeting Planners call upon HollyBarry House to provide welcoming gifts for convention speakers, thank you gifts for meeting sponsors or major buyers, favors or token gifts for attendees, prizes or raffle gifts. Gifts for company parties and picnics can also be provided. Specific city themes can be special ordered. 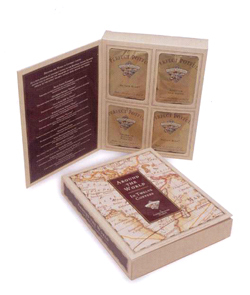 A worldwide tour of twelve of the finest Arabica coffees packaged in freshly ground, pre-measured 8-cup potful packets. Gift card can read: "Working with you means the world to us", or "A World of Thanks" or "Wishing You A World of Success." Be creative. "HollyBarry House is the best marketing tool a business owner could ask for!" "(HollyBarry House) has great ideas and great follow through with everything we did together. I am looking forward to working with (HBH) as my business grows...always supportive and makes gift giving a meaningful experience." "Gifting a client or business associate is a good idea. Working with HollyBarry House is a superlative idea. Every basket generated more than expected 'thank yous' on the magnitude of 10-fold. HBH gifts are a reflection on how we value the recipient AND reflects on us as a company. We didn't just pick a vanilla item from a vanilla catalog. (HBH) helped us find a gift that was perfectly matched to our customer...(HBH) is a class act with old-fashioned commitment to excellence and timeliness--which is rare these days."